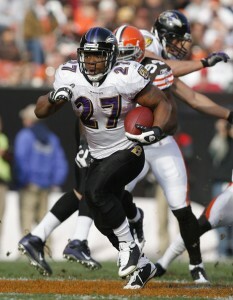 Baltimore Ravens RB, Ray Rice, should be one of the top players in both the AFC North and the entire NFL. The NFL season started tonight in Wisconsin, where the defending Super Bowl Champion Green Bay Packers will play host to the New Orleans Saints – the 2009 Super Bowl Champions. For teams in the AFC North, Sunday will mark their season openers. All four AFC North teams play each other this weekend, which will give the winners an early edge on the losers. Before the season kicks off for the Bengals, Browns, Ravens and Steelers, here’s a look at my AFC North Preseason Wards. 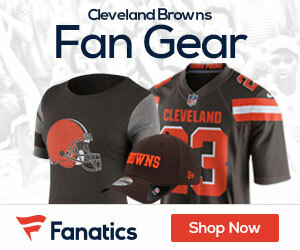 – Taylor was Cleveland’s first-round pick in this year’s NFL Draft and was has always been expected to be an immediate starter on the Browns defensive front in their new-look 4-3 defense. The Browns have a lot riding on Taylor’s potential to be a star in this league, as the team can hardly afford to have another first-round draft pick fall by the wayside. I think Taylor will rank among the top five young defensive tackles in the league before all is said and done and is also my pick for, not just the AFC North, but the NFL Defensive Rookie of the Year. – With rookie QB Andy Dalton also starting on the Bengals offense, Green may struggle early while he and Dalton look to feel each other out. However, Green is easily the most talented rookie in the AFC North on the offensive side of the ball. Of course, Green – like Dalton – has an enormous amount of pressure on his shoulders. Dalton is taking over for former Pro Bowl QB Carson Palmer, who decided to retire after team owner Mike Brown refused to trade him. Green, however, is taking over for fan-favorite, Chad Ochocinco, who was traded to the Patriots this off-season. Don’t expect Green to put up Ocho-type numbers, but he should more than hold his own as a rookie WR in the NFL. 2010 Stats: Started 14 of 16 games. 307 rush attempts, 1220 yards and 5 TDs. 63 receptions for 556 yards and One TD. 1776 yards from scrimmage. Zero fumbles. – Rice saw an increase in carries in 2010, but saw a drop in rushing yards, rushing TDs, receptions and reception yardage from his 2009 season. QB Joe Flacco has some nice weapons with Anquan Boldin and Lee Evans at WR, and Ed Dickson and Dennis Pitta at Tight End. With a productive passing game, it should open the running game for Rice. Look for Rice to increase his production from the 2010 season while being the workhorse for a playoff contending Baltimore Raven team. 2010 Stats: Played in all 16 games. Recorded 20 tackles – 15 solo, 5 assisted and 3 sacks. – Hood’s career numbers aren’t all that impressive, as last year’s stat line marks a career high. He also is listed at #2 on the Steelers depth chart at left defensive end behind Aaron Smith. But here’s why I think the third-year pro has the potential to be the AFC North’s Defensive MVP: he’s young, talented and plays on a Steelers defensive that starts 9 guys on defense over the age of 30 – including Smith, who is one of the oldest at 35. It’s hard to imagine Smith being able to continue to play at a high level on a consistent defense, which would result in an increase in playing time for Hood. There’s no doubt Hood has All-Pro potential, but it will all depend on how he handles a more active role on the Steelers defensive front. I just think Rice is coming into this season focused, poised and ready to take his game to the next level. Rice has proven to be one of the more versatile backs in not just the AFC North, but the entire NFL. He’s coming off a season in which he saw a career high in carries with 307, but with newly acquired back-up Ricky Williams serving as his back-up, Rice should see a lower total of attempts this year. If Rice can stay healthy, he’ll easily be one of the top offensive players in the AFC North. – If Jackson can manage to stay healthy, he the potential to be one of the top linebackers in the entire league. The Browns are transitioning to a 4-3 defense this season and, after watching Jackson in the preseason, it appears to be just what the team needed to do to create a monster at the MLB position. Of course, this is all only possible if Jackson can manage to stay healthy for the entire season. In 2008, a then healthy D’Qwell Jackson had a monstrous season, had a monstrous season, recording 154 tackles – 95 solo, 59 assisted with 2 sacks and 3 INTs. Jackson will have the opportunity to establish himself as one of the premiere defenders in the AFC North this season, but only if he can remain healthy. 2010 Stats: Played in 9 games. Recorded 16 receptions for 167 yards. Also had 36 returns for 507 yards and One TD, combined on kick-offs and punt returns. – Brown’s impact was more in the return game than as a WR, but that should change this season. As much as Steelers fans want to deny it, fan-favorite Hines Ward is getting older and could be just a few seasons away from the end of his career. Pittsburgh already has a rising star opposite of Ward in Mike Wallace, but Brown should see an increase in his playing time this coming season. Don’t be surprised if Brown ends up with around 50+ receptions and close to 800 yards receiving this season. It’s also almost a sure bet that he’ll score his first of many receiving TDs this season. 2010 Stats (Rookie Year): Played in all 16 games. Recorded 65 tackles – 58 solo, 7 assisted, One sack, 6 INTs, One forced fumble and 18 passes defended. – Many “experts” among the media claim that Haden is the best CB the league has seen since the Jets’ Derrell Revis came into the league. In his rookie season, Haden proved that he has all the skills to make him one of the best – if not the best – cover corner in all of the NFL. He also showed that he’s not afraid to play up around the line of scrimmage in support of the run game. They often say that a player shows the most improvement from the first to second year in their career. If true, that’s scary news for the rest of the AFC North, and phenomenal news for the Dawg Pound. – Shurmur spent last season as the St. Louis Rams offensive coordinator and did a tremendous job with a seemingly untalented Rams offense. The starting QB for the Rams was rookie Sam Bradford, who posted above-average stats for a rookie QB last season. In Cleveland, Shurmur will look to accomplish the same kind of offensive success with Colt McCoy, who was also a rookie last season. McCoy is going to directly benefit from having Shurmur as his head coach, and it’s already showed in the team’s four preseason games. But it’s not just Shurmur’s offensive mind that is going to make him the AFC North’s Coach of the Year, it’s also the type of coach that he is and what he means to the players on his team. Last season, Browns players suffered through an entire season with Eric Mangini as a head coach, and rumors have surfaced that Mangini did everything he possibly could to ensure the Browns weren’t successful last season. Shurmur is known as a “player’s coach” and the Browns players have already raved about how great it is to finally have a head coach they are comfortable with. Shurmur should give the Browns organization the kind of stability at head coach that they’ve longed for since the team’s return to the NFL in 1999. As a result, don’t be surprised if the Browns show incredible improvement under Shurmur’s leadership, thus making him the AFC North’s Coach of the Year. Well there you have it, my preseason award predictions for the AFC North. I promise, I was as unbiased as possible when I decided on who should win what award. Do you have any idea how painful it was for me to list anyone from the Steelers organization among the award winners? Here’s to a fun and exciting season in the always competitive AFC North.